Dr. Nicholas Sgaglione is Professor and Chair of the Department of Orthopaedic Surgery at North Shore Long Island Jewish Medical Center and at the Hofstra University North Shore-LIJ Medical School and has been in clinical practice for 26 years in Great Neck, New York. He graduated from the Mount Sinai School of Medicine, where he also completed a surgical internship. He completed his residency in orthopaedic surgery at the Hospital for Special Surgery in New York and a fellowship in sports medicine at the Southern California Orthopaedic Institute in Los Angeles. 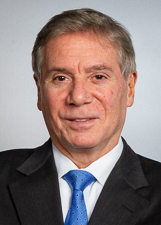 He also serves as the Senior Vice President for Orthopaedics for the North Shore Long Island Jewish Health System and Executive Director of the North Shore-LIJ Orthopaedic Institute. Dr. Sgaglione was elected president of the Arthroscopy Association of North America for 2012-2013 and has served on its Board of Directors since 2008. He was elected to the American Orthopaedic Association in 2006 and currently is a trustee of the AANA Education Foundation and Association Member Representative for the Orthopaedic Learning Center in Rosemont, Illinois. He is an active member of the American Orthopaedic Association, American Academy of Orthopaedic Surgeons, American Orthopaedic Society of Sports Medicine and International Cartilage Repair Society. Dr. Sgaglione serves on the Board of Trustees of the Arthroscopy Journal as well as the editorial board of several medical journals and is the author of three textbooks and 75 published articles and chapters on arthrosocpy, minimally invasive surgery and knee, shoulder and cartilage surgery. Dr. Sgaglione has been a national and international clinical leader and educator specializing in sports medicine, particularly knee, shoulder and elbow problems and arthroscopic and reconstructive surgery including knee and shoulder replacement surgery and cartilage transplantation and joint preservation and biorestoration. Dr. Sgaglione currently practices sports medicine and has served as the orthopaedic consultant for the United States Ski Team, US PGA and for numerous Long Island High Schools. He has served as the team orthopaedist for the United States Merchant Marine Academy for the past 24 years. More recently he has served as the team orthopaedist for the Major League Lacrosse New York Lizards. He is listed and recognized in Best Doctors of New York and Best Doctors of America since 2007. "Dr. Sgaglione is a very caring physician. He did surgery on my other shoulder 3 yrs. ago. I was so lucky to have him again as my surgeon. " "Dr. Sgaglione is very professional. He explains and answers questions clearly and thoroughly." "Doctor Sgaglione is awesome 10 of 10. He is the reason I didn't go to HSS for my surgery. He did an outstanding job. He is the best in my opinion. " "He actually sat with me and drew up a flow chart to show options with cause and effect results! for my case." "Dr. Sgaglione operated on me 3 yrs. ago. Now i need surgery on my other shoulder. There is no other doctor that I would consider to do that surgery but Dr. Sgaglione. He is a very competent and compassionate physician." "Excellent doctor. Explains & shows all radiological & surgical pictures on computer." "I am very satisfied. I would recommend highly." "Dr. Sgaglione is very professional & caring physician." "I want to thank Dr. Sgaglione for his attention, knowledge, understanding. I can recommend this doctor to other people. Thank to all the staff in the office." "Dr. Sgaglione is the most impressive of all doctors I have seen. Kind, helpful & informative." "if there were a higher than five I would give it." "I have recommended Dr. Sgaglione multiple times." "Dr. Sgaglione is very nice. caring, and very honest in the recommendations for my condition I am so glad Dr. Michael De Angelis recommended him to me, and I will recommend him to anyone who is looking for a great Orthopedist, and when the time comes I might need surgery I pray he is still around." "Anthony and Dr. Sgaglione are great with their bedside manner. Very informative and efficient!" "The dr. was efficient, kind, understanding and his recommendations were clearly understood and appreciated. While the dr. did not examine my other troubled body complaints we did discuss them, and I was given good advice!" "As a former NSUH OR Nurse I can say that Dr. Sgaglione is a highly skilled, competent and caring surgeon." "Dr. Sgaglione is an excellent doctor and the only dr. I would see." "Dr. Scaglione was wonderful when he explained my options. He wrote everything down for me so I would have a reference. I really appreciated this effort. He explained everything he was going to do when he gave me an injection and I felt no pain, unlike the previous doctor I saw for this issue." "Dr. Sgaglione is an exceptional doctor. He treats every patient with such care and concern. He is a very special person." "Since the dr. didn't feel I needed surgery now, but will in my lifetime, went thru his checklist thoroughly, but quickly! I know his time is valuable but after waiting 3 months. I was hoping for a few more minutes to process info I was given so I could ask questions." "Dr. Sgaglione is an excellent doctor. He is very caring and I have a lot of trust in him. He replaced both my knees. Had excellent result." "Excellent visit with fully explained options." "Simply the "best" physician period. " "I've visited 4 ortho doctors for my problem. Dr. Sgaglione was by far the best." "Dr. Sgaglione is top shelf. His staff is friendly and professional. I'm very pleased with the service I was provided." "Dr. Sgaglione was awesome I knew within 5 minutes of meeting him, that he was the surgeon for me." "Dr. Sgaglione is an outstanding, knowledgable doctor and a compassionate, caring individual. I wouldn't trust my bones to any other." "I've had two operations which had excellent results. I would recommend Dr. Sgaglione to anyone needing a procedure." "This doctor is the best." "Dr. Sgaglione wrote down all follow-up information and gave it to me to take home - excellent!" "Very concerned of all aspects of check up very professional." "I have arthritis of the two shoulders & MUST have a shot every 3 months. A must!" "Dr. Sgaglione is knowledgeable, courteous, and very caring - Excellent experience with him!" "This was my first visit and Dr. was amazing...very clearly explained a lot of things...felt confident in what he said...great manner in dealing with me." "Dr. Sgaglione did an amazing job of helping me understand my shoulder issue. I was extremely impressed and put at ease that he was a well-experienced doctor." "I'm very happy with this doctor and will recommend him to family and friends"
"Dr. Sgaglione gave me confidence in his ability to help me." "Dr. Sgaglione is not only an excellent doctor, but he is a caring and compassonate doctor. During my visit I explained to him a very complicated shoulder problem a very close friend was having. He immediatley called his secretary to get the information from me and told her to made an immeiate appointment for her which was done. I was back with my friend adthree days later and she was so grateful and felt she wa finally in good hands." "Dr. Sgaglione is the best doctor I have - wonderful bedside manner, caring, kind etc." "Excellent experience!! Have already recommended to other people!" "Even if I waited the physician then spent time with me explaining all procedures and allowed me time to discuss any concerns I may have. It was worth the little wait to know I wasn't going to be rushed"
"I have trust & faith in Dr. Sgaglione & hope he will help me again & would definitely recommend him." "Very good experience with provider & staff." "It was a totally very good experience." "I was impressed with Dr. Sgaglione and his responding to my situation." "Dr. Sgaglione is an excellent doctor and an amazing human being." "Dr. Sgaglione is a great surgeon and knowledgeable doctor. I totally trust him as my doctor." "Very professional, but needed to be more friendly." "As I said Dr. Sgaglione is by far the best around." "Dr. Sgaglione is fabulous & I feel fortunate to have found him. I got lucky!!" "Dr. Sgaglione is the most compassionate doctor I have ever had." Tennis elbow is a condition that impacts more than just athletes. Find relief for the strange forearm pain. Nicholas Sgaglione, MD, Chair, Orthopedics, NSUH & LIJMC; Giles Scuderi, MD, VP, Orthopedic Services, North Shore-LIJHS Knee pain can be debilitating, often making only a short walk an impossible task. While non-surgical treatments are often attempted for initial treatment, there are situations where knee surgery becomes the recommended or necessary treatment. Topics include different types of knee surgery and how conditions are best treated.